New Chitose Airport / Sapporo ~ Niseko, Kiroro, Tomamu, Furano etc. **Niseko, Rusutsu, Kiroro, Otaru, Tomamu, Sahoro, Furano, Asahikawa, Lake Toya, Noboribetsu, Hakodate, Yubari, Teine etc. ★ALL THE COST INCLUDED ! *Included; Meet & Greet Service with your Name board, Toll & Parking fee, sales tax(8%). You needn't to pay any on the spot! book & pay 2 sectors and more than 2 weeks before = "4% discount"
*Discount 2% only : "Airport - Sapporo v.v. ", and/or "any sector of Charter Taxi, and Bus service." *If you change any within 2 weeks, normal rate will be apply. You could choice Luxury Van & Luxury Mini Van ! Make you more comfortable with wider seat & leg rest ! *Please see detail conditions in below. Need surcharge on some peak period, late night & last minutes booking. *[Important Notice] at airport, our driver wait you maximum [90 min.-International] / [45 min.-Domestic] from actual arrival time of flight which reported by Chitose airport authority. In case you feel difficulties for meeting on time, please inform by call (not by mail) for avoid cancellation. ・Last minute up; Book & pay within 48 hours from service; +JPY1,500 for all case. * Regarding payment (need 2% charge) & condition, please check below [Common Condition & Payment] info. *Good for 12 guests + 12 bags. *Good for 18 guests + 18 bags. ★If you are more than 20 guest, please contact us for Big Bus use. ☆Regarding other destination, like Furano, Sahoro, Hakodate, etc., please contact us. ・Late night & Early morning up; Please check above. Minimum up charge is 10%. it depends on timing and date. For pick up and drop off destinations that are not mentioned above, please don't hesitate to send your inquiry here. Cancel charge; need from 7 days (Bus; 14 days) before service. (Peak period from 14 days before). Please see detail at Order page. Price might be change without prior notice. Payment charge of PayPal is around 4%. * We make 2% discount from it. So you just add 2% payment charge to your service cost. Enjoy Sapporo night with wonderful Night View and Beautiful Light Up! with 2-way Private transfer ! *when you book this Winter Promotion, please use "INQUIRY" button instead. *This is Japanese speaking driver service. We will pass the map of meeting point. English service is available with charge. & Tokyo, Osaka area etc..
at New Chitose, Sapporo and other major area at Tokyo, Osaka, Hiroshima etc. 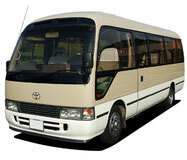 - Sedan, Mini Van, Van, Bus (19 seater to 49 seater), also Luxury type of Mini Van, Van and Bus. ★We just mentioned Transfer tariff between major spots on Aug.2018-Mar.2019 only. Please contact us for other sector & Tour.